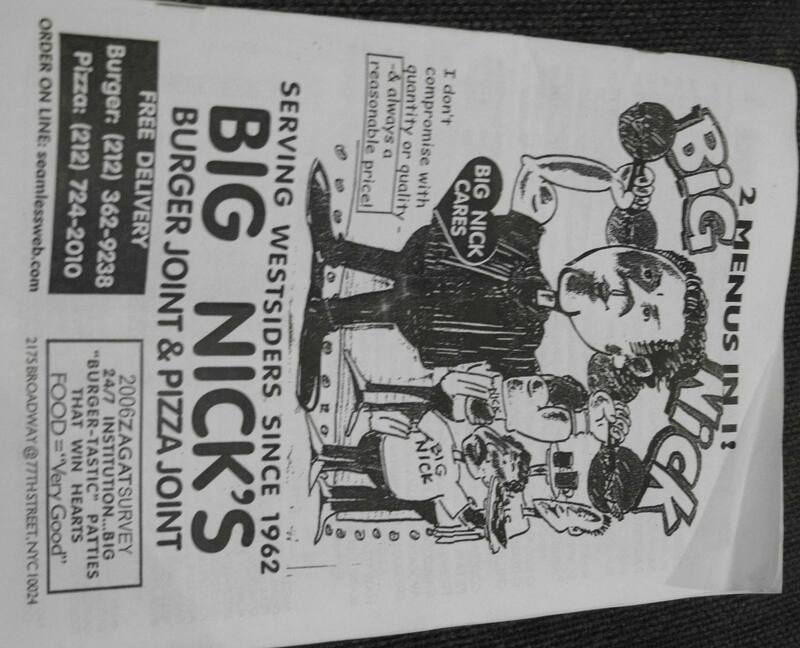 After a busy past week and even busier weekend I decided today was the day to make a pit stop at the “World Famous” Big Nick’s Burger Joint & Pizza Joint located on the upper west side of Manhattan at 2175 Broadway and 77th St. As I walked by the place two female employees of Big Nick’s beckoned me to come in. I hesitated at first by shear natural impulse. You know the one you get when a sudden voice in your head says this a moment do you or don’t you? Seeing as how I hadn’t eaten all day the stomach cried out for food and so I gave in to impulse. I decided against sitting down to eat as I normally would due to a tight schedule for the day and so I got my order to go. First off here’s an idea of the depth of their to go menu. This paper booklet of a menu may appear small on it’s face but has actually over 27 pages of menu items to choose from. I’ll say that again over 27 pages of different foods they serve and the best part of it all being they operate 24 hrs a day. After sitting down at the counter and being presented courteously with a huge house menu I decided immediately to go for two of Big Nicks most expensive burgers. 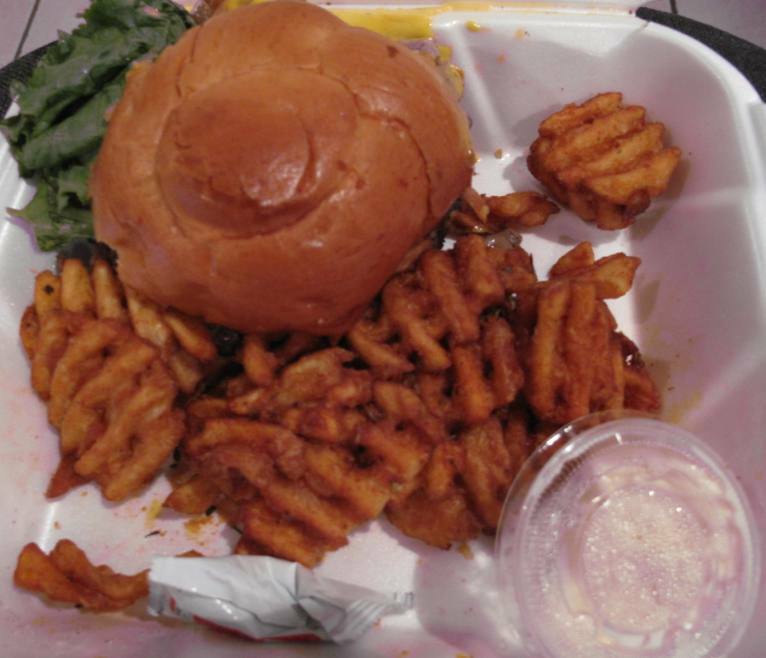 The first burger I selected was the vaunted Sumo Burger. I wanted mine with cheese and I knew it would be extra I just hadn’t anticipated it costing $3.25 just to add a couple slices of American cheese, but yes that was the price paid for that little luxury. 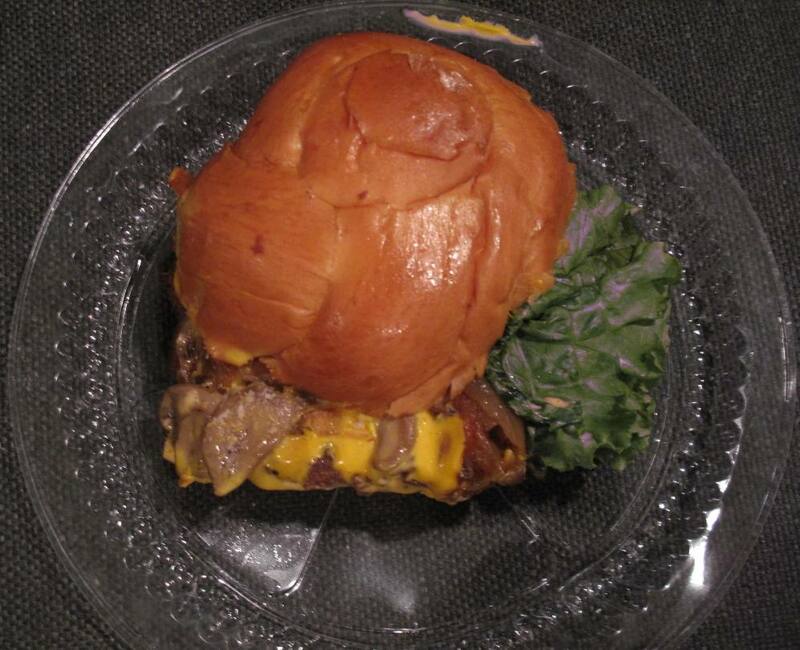 The Sumo Burger is, according to Big Nick’s 100% Angus Steer Beef with one of these patties weighing in at over 1 pound. 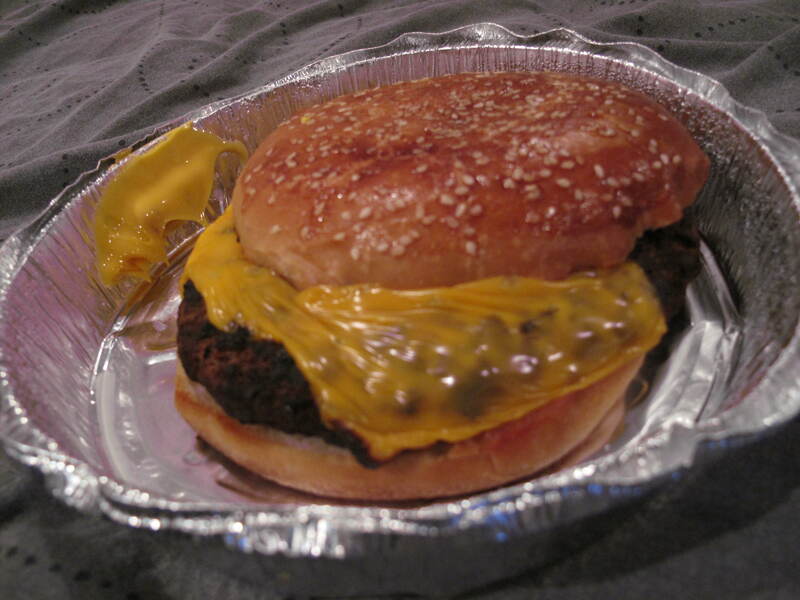 I had mine without lettuce and tomato and just opted for American cheese, ketchup, and mayo with my burger cooked very well done as I generally don’t like my meat rare or having any semblance of pink in it. Here’s what their to go menu looks like below. 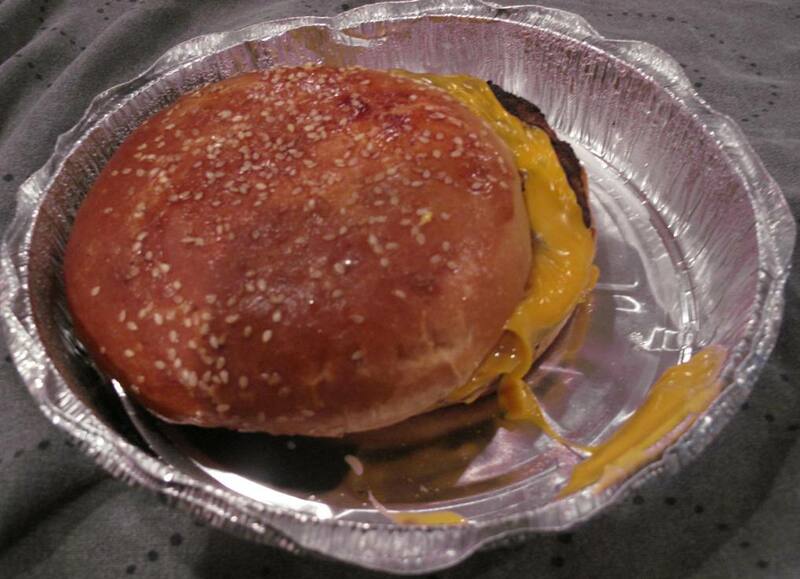 The second burger I selected was Big Nick’s Kobe Beef Burger. I have never had Kobe beef before but as I understand it, Kobe beef are Japanese raised cows that are grass fed and pampered with all manner of treatments including massage and music all throughout their raising before they are slaughtered. It’s supposedly one of the best if not the best beef in the world. Once again I decided to add cheese to my burger and have this one cooked well done instead of very well done. I chose this order to come with tater tots but seeing as they were conspicuously out of tots I opted for their waffle fries which in opinion is more than a suitable substitute for tater tots though I do love some good tots MMmm MMmm!!! On a plate or in a box it’s all goot!! Oh the power of meat and cheese!!! 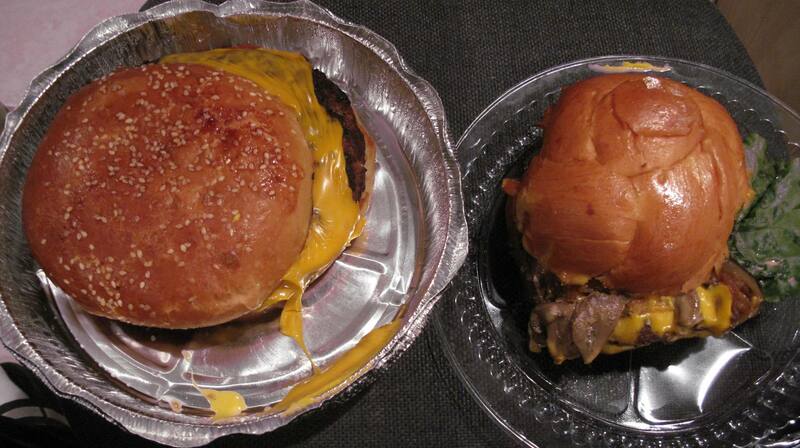 Now to give you some perspective in the size difference between these two burgers the picture below give a side by side.